You have found Red Robin menu prices. Red Robin Burgers and Brews is a casual dining restaurant that is known for offering over two dozen freshly made gourmet burgers. The menu also features appetizers, soups, salads, wraps, sandwiches, and entrées. Don’t forget the famous steak fries and Bottomless Beverages (TM). All Red Robin locations are open for lunch and dinner. Reservations are recommended especially if celebrating a special occasion or dining with a large group. Below are the latest Red Robin menu prices. What is better than a gift that tastes great. Red Robin gift cards are a perfect way to show your appreciation. Give them to co-workers, the mailman, or the auto mechanic. No matter who gets one, they will be satisfied. You can send a traditional, personalized gift card via the postal service or if you need it delivered sooner, you can send an e-gift card to the recipient’s email inbox. Either way, you will look like a rock star! Looking for a few minutes of downtime fun? Check out the Burger Hub. A compilation of fun and wacky videos about Red Robin. Red Robin believes in giving back to the communities where they operate. Red Robin participates in several programs that help individuals as well as communities, through fundraising efforts and donations. Their ‘Burgers for Better Schools’ program allows families to enroll their school with 1% what they spend being donated to the school. The Red Robin Foundation is a charitable organization that helps Team Members and the communities they live in. Before you take the kids to Red Robin to enjoy some great tasting menu items, have them take a look at the Kids page on the Red Robin website. There, kids can download cool science experiments or play neat online video games. The guest recognition program makes you feel like royalty. It is simple to sign up and the benefits last all year. Besides earning free burgers and discounts, you will get exclusive offers and special deal all year. You don’t need to wait for Black Friday or Christmas to shop online at Red Robin. Check out their Merchandise page where you can buy cooking accessories, apparel, or the Famous Red Robin seasoning. The Red Robin nutrition guide has taken away the guesswork when it comes to figuring out how many calories or fat your meal has. If you are counting calories or following a restrictive diet, head over the Customizer Hub page where you can customize your meal to meet your specific targets. For food allergy sufferers, you can also visit the Customizer Hub page. The interactive menu allows you to specify what you are allergic to and makes menu suggestions. Are you ready to embrace the Red Robin B.U.R.G.E.R. values? If you are enthusiastic, high energy, and committed to providing top notch customer service, then check out the Red Robin Career page on their official website. There, you can learn more about the history of Red Robin, current opportunities, and details about their competitive pay and benefits package. Team members also receive training, perks & discounts. If you are interested in reading more about Red Robin, visit their official website. How did Red Robin Burgers and Brew get started? In 1969, Gerry Kingen, a restaurant entrepreneur, purchased an existing tavern called Sam’s Red Robin in Seattle, WA. Gerry dropped the “Sam’s” and the new place was named Red Robin. After a few years of operating as a tavern, Gerry introduced several types of burgers and the rest, they say, is history. 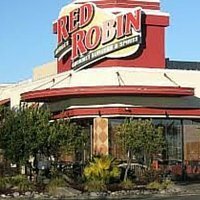 Who owns Red Robin Burgers and Brews and where are they headquartered? Red Robin Burgers and Brews is a publicly traded company headquartered in Greenwood Village, CO, and operates over 500 locations in the U.S. & Canada. Well there’s your problem. You went to a Red Robin and hallucinated that you were at Applebee’s. kathleen shut up this isn’t were you leave your review. Hope to try this restaurant soon. Ive heard lots of good things about it. The Cheese burger which had no cheese on it was so thin I thought I was in Steak n Shake. It was tasteless. I opted for onion rings instead of FF and was charged $1.50 more. The $10.88 for my order was not worth the cost. I can go to Too Jays get the same thing pay less money get FF and cole slaw. If you wanted to sign up for rewards you had the agree to get phone calls from Telemarketers. No Thank You. Was Informed You Sell Fried Zucchini But Didn’t See On The Menu !! !